Have a child roll the second die. This is how many repetitions or how many counts of the activity children will do. Use less vigorous on-the-spot activities such as touching your toes, clapping your hands or reaching up high while on your tip toes. 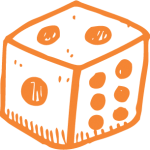 Roll more than one die to determine the number of repetitions and have children add the numbers.